Under en bedre middag på restaurant Meet i Liverpool, søndag 23.september 2007, ble Tage Herstad utnevnt som æresmedlem av Liverbirds Aalesund. 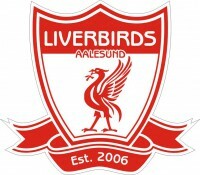 Tage stod i sin tid bak Florø Liverbirds, og har gitt oss mye hjelp i oppstarten av Liverbirds Aalesund, da mest vesentlig med sine kontakter innad i Liverpool og blant Liverpoollegendene. Han har bl.a. vært med på å få Liverpool Legends til Ålesund to ganger, som en del av oppholdet i FotballFlora i Florø. Tage er den nordmannen som har scoret flest mål på Wembley, da han puttet 3 mål i den aller siste kampen som ble spilt før stadionen ble revet. Tage har også spilt og scoret på Anfield. Tage bor i Liverpool, i 288 Anfield Road. Rett over gaten, i 97/99 Anfield Road, leier han ut til Liverpoolfans som foretrekker billig overnatting. Inkludert i leia er sjølsagt kampbillett på Anfield. Tage bor sammen med Kamilla og sine to barn, Tia Louise og William Shankly. Som dokke skjønner, dette er ekte supportere. Tage har her akkurat mottatt Jugendkonjakken fra Liverbirds Aalesund, ei hedersbevisning vi har gitt alle våre æresmedlemmer. Breaking news: Tage har fått seg jobb som engelsk/scouse/norsk oversetter! Han skal nå prøve å oversette det David Moyes prøver å forklare norske journalister på diverse pressekonferanser i anledning Brann-Everton og Everton-Brann. Vi vil komme tilbake med mer om Tage… alltid, litt no og da, kanskje ikkje ofte, kanskje ofte. Forever remembered as the ‘Supersub’ of the last part of the 70’s. It’s a tag he detests, but which has probably brought him a good living as an after-dinner speaker since he retired from the game! Local boy David exploded onto the football scene as a 19 year old to add some fresh impetus to Liverpool’s neck-and-neck challenge with QPR for the First Division championship. In much the same way as Ronnie Rosenthal’s arrival gave a new and unpredictable boost to the crucial final leg of the 1989-90 season, David’s 7 goals from 5 starts with 9 substitute appearances were a big factor in Liverpool finally overhauling the Londoners in the final match of the season. Although it is his ‘famous’ goal against St. Etienne the following season which is most remembered, a mazy run from the half-way line with two minutes to go in the Anfield derby turned a goal-less draw into a priceless victory. That extra point was vital in the final analysis in 1976. As one of his colleagues said at the time «He didn’t know himself what he was going to do, so how could WE know?!». It was hard for Fairclough to break the Keegan/Toshack partnership which was well-established but the Welshman’s injury problems did give him a number of opportunities the following season, when Liverpool were competing for honours at home and abroad right to the end of an amazing season. However, there were only a further 3 league goals from 20 appearances (8 as a sub) to add to the 7 from the end of the season before. But on the 16th of March 1977 came the moment that would change his life. Liverpool was trailing by the away goal to the French champions with time running out in a frenzied atmosphere at Anfield in the European Cup quarter final. David latched on to Ray Kennedy’s lob and headed for goal. The ‘legend’ will tell you that he beat several defenders on his way into Merseyside folklore but the reality is that he kept his eye on the ball, brushed aside any challenge from a defender and then calmly tucked his right-foot shot under Curkovic into the Kop goal to bring about scenes which those who were there still talk about with a lump in their throat and a shiver down their spine! It was always going to be a hard act to follow but the following season never saw David Fairclough really establish himself as a permanent member of the first team, although he did start 26 league matches and was also in the starting line-up when the Reds successfully defended their European crown at Wembley in the Spring. But he only made a further 21 league starts for Liverpool after that before finally leaving Anfield for the last time in 1983 (there had been a brief spell in America in the early 80’s). David’s final figures for Liverpool still make impressive reading though. 37 goals from 92 starts is a fine achievement but he never quite got rid of the ‘Supersub’ nickname and that is borne out by the fact that he scored 18 goals in 62 substitute appearances! But his contribution towards the club’s success of the late 70’s and early 80’s should not be underestimated. Maybe he did have a tendency to drift in and out of some matches but his pace and unpredictability caused havoc to many a defence and his ‘golden’ moment against St. Etienne is one which will never be forgotten. http://www.youtube.com/watch?v=FfSExsXVLg0 100 players who shook The Kop’. David jobber i dag som ekspertkommentator på radio/tv, han har sine egne innlegg på Liverpool’s hjemmeside, han driver det godt innen byggebransjen og liker godt å spille poker. I tillegg er han med legendene så ofte han kan.
http://www.youtube.com/watch?v=X8XNZbvyU4Q We won it 5 times! A great attacking full-back who had the knack of scoring vital goals for Liverpool that brought further glory to the club. He’s Liverpool’s history in the early 80’s embodied. Who can forget when he scored the winning goal in Paris vs Real Madrid in the 1981 European Cup final and noone can ever forget the look on his face when he celebrated the deciding spot-kick in Rome 1984. Alan had been a 19 year old full-back for Newcastle United on the day that Liverpool destroyed his FA Cup final hopes in 1974 by outplaying the Geordies 3-0 at Wembley. He didn’t know it at the time but although he never would collect a winners’ medal in the FA Cup, he would win more trophies than he could ever have dreamed possible after his transfer from the North-East to Merseyside just before the start of the 1978-79 season. The left-back had been a bit of a ‘problem-area’ for Liverpool in 1977-78 with Joey Jones, Tommy Smith & Alan Hansen all wearing the No. 3 shirt at some stage of that season. But Alan stepped confidently into their shoes and played 37 league games in each of his first two seasons at Anfield, winning League championship medals on both occasions. Alan missed much of the 1980-81 season through injury but still contributed two priceless goals from full-back to keep the club’s run of success going on into the 80’s. His extra-time goal narrowly failed to beat West Ham in the League cup final at Wembley but he was a member of the team that beat the Hammers in the Aston Villa replay 18 days later. Then on an unforgettable night in Paris eight weeks after that his blistering cross-shot fizzed past the Real Madrid keeper in a blur to bring the European cup to Anfield for the 3rd time in 5 seasons. His astonishing record of scoring in big games continued as he struck a second-half equaliser against Manchester United in the 1983 League Cup final and then a year later came the most dramatic moment of all, the decisive penalty-kick in the shoot-out that followed the 1-1 draw with the Italian champions from Rome, who had been given the extremely unfair advantage of playing the European Cup final at their own stadium. Kennedy still played in most of the following season’s First Division fixtures but by the end of the season his place had been taken by Jim Beglin. Alan did play in the opening 8 league matches of the 1985-86 season but a comical own-goal in the last of those games at Oxford may have been the final straw for the new player-manager, Kenny Dalglish. Alan never played for the club again and Phil Neal, his full-back partner for so long and with whom he had enjoyed so much success, would only last a few more games before he too was replaced by Steve Nicol. Alan had a brief spell in Belgium, Denmark and Sweden and also with Hartlepool and Wrexham in the lower divisions of the Football League before continuing to play non-league football until he had passed his 40th birthday.